Following the success of our first event in 2015, PC Photographic and Trailblazer Outdoors are delighted to announce MOORSVIEW 2017. Once again renowned local photographers will come together to celebrate the beauty of the North York Moors and Coast, highlighting the opportunities they offer for outdoor photographers. But this time the inspirational sessions will cover both landscape and wildlife photography. Less frequented than the Northern meccas of The Peak District, Lakes, and Yorkshire Dales, the North York Moors offer a rich variety of landscape and wildlife opportunities. From the expansive open views on the high moors to the intimate patchworks of a succession of verdant dales, this is a landscape of contrasts shaped by a long history of human habitation. Field sports, hill farming and forestry are the most obvious influences today, but the environment has also been shaped by industries such as mining, quarrying and glass manufacture. The coast ranges from high chalk cliffs in the south to fossil rich shales in the North, featuring a succession of sweeping bays and coves, peppered with precipitous fishing villages and shipwrecks. Host to internationally important breeding populations of seabirds and Grey Seals, the area also offers a growing range of wildlife watching and photographic opportunities - including whale watching and diving gannet trips. The Moorsview sessions will focus on the practical aspects of photography in the region, whilst touching on the broader themes of man’s historic use of the moorland and coastal landscapes, their conservation, and the impact of human activity on the wildlife of the area. Inspiring presentations on capturing this wealth of photographic opportunities will come from a stellar line up of speakers. Needing no introduction to the readers of On Landscape (click here to read Joe's articles), Joe lives on the western edge of the North York Moors - close to the local landmark of Roseberry Topping. For Joe, this landscape is no pristine wilderness or manicured park. Rather, it is a working upland -covered by great carpets of heather that can be a forbidding, bristling black, or an opulent purple haze - depending on the conditions and time of year. Joe says: “The years of walking, of standing in the teeth of a gale, or clambering through snowdrifts, of marvelling at spring wildflowers in the gritty, peaty soils, of watching the sun sinking over the blanket of August heather, or of climbing up through mist onto high ridges on an autumn morning … these years have helped me understand the moods and beauty of the moors. We have asked Joe to look back over the years, and assess how his photography of the region has changed and developed - as a result of changes in his own photographic vision, the equipment he uses, and the landscape itself. I first came across Peter Leeming’s work when I found that some of my pictures were hanging next to his at the Inspired by gallery, in Danby. The exhibition was to celebrate the 60th Anniversary of the North York Moors National Park, and I remember thinking his pictures had greater maturity than mine. Next to Peter’s calm, assured, natural evocation of his subjects, mine looked like they were ‘trying too hard’, and shouting for attention. Lucy Saggers is an award-winning photographer of rural life, who is currently documenting the richness of life in her home village of Ampleforth. Lucy's evocative black and white images capture the allure of the landscape, and the essence of ordinary lives - recording the small, often unseen moments, to tell a contemporary story of the fabric of the countryside. Her work blends landscape and documentary photography - exploring the interactions between the land and the people that work it. The character of one is shaped by the other, and vice versa. Her work challenges us to consider the ‘living landscape’ - something which is used, exploited, formed by the rural economy and our other interactions with it. For me Lucy's deliberate use of stark black and white also helps to draw out these graphic interactions, lending her images a certain timeless quality that stands apart from much contemporary landscape photography. Lucy Saggers was a finalist in the Pink Lady Food Photographer of the Year in 2015 and 2016, and shortlisted this year. She was also Craft Photographer of the Year in 2015 and reached the 2nd round of the National Portrait Gallery Taylor Wessing Photographic Portrait Prize. Her presentation at Moorsview 2017 will add another fascinating and inspirational strand to the day. Steve is an award-winning wildlife photographer and trainer based in Scarborough and has been a keen naturalist and photographer for over 30 years. Over that time he has acquired an exceptional knowledge of the wild environments of the moors and coast, and the behaviours of the animals that live there. Steve uses this expertise to pick out the details of everyday life for the birds and animals he photographs - depicting wildlife in its context. Steve is best known for his coastal photography and workshops, but for Moorsview 2017 he will focus on the variety of wildlife and habitats offered by the inland landscape of the North York Moors. Steve’s images have featured in national and regional newspapers and magazines, websites and other publications. He works with the RSPB, the National Trust and the Yorkshire Wildlife Trust, and has recently been an adviser on the Channel 5 television series Yorkshire: A Year in the Wild. In 2013 his work was “Commended” in the ‘Wildlife Photographer of the Year’ and ‘British Wildlife Photographer of the Year’ awards. In 2014 he was “Commended” in the ‘Big Picture Natural World Photography Competition’ at the California Academy of Sciences, San Francisco, USA. Robert is best known as one of Britain’s foremost wildlife artists, but he is also an accomplished photographer - painstakingly observing and capturing the behaviours of his wild subjects as source material for subsequent paintings. In 2016 he won the British Seasons category in the British Wildlife Photography Awards for his series of shots of a family of weasels. The previous year his stunning shot of ‘Sparring Sparrowhawks’ was highly commended in the same awards. Recently you may have seen Robert’s fantastic footage of Kingfishers - featured recently in the BBC’s Springwatch series. The images were the result of months of work in constructing a hide specifically for the purpose of observing, photographing and filming these glorious creatures. Robert’s Moorsview presentation will discuss this and other projects where he has used particular techniques to follow the lives of birds and animals around his Thixendale Gallery, and capture aspects of their everyday lives. Karl feels an intimate connection with the landscapes of the North York Moors and Coast - having spent much of his childhood and adolescence exploring them on foot and by bike. Hailing from a family of photographers, some of his earliest memories are of developing black and white images from such trips in his Father’s dark room. When I think of Karl’s work I tend to think of fairly 'clean' images, which tend towards the minimalist, and evoke a sense of calm reflection. He works in both colour and black and white, often using ND filters and long exposure times to soften water and emphasise the graphic qualities of a scene. For Moorsview 2017 Karl will address his personal connection to the North York Moors National Park, before looking in detail at coastal photography. He will consider the dynamics of the coastal environment, before exploring the use of abstract imagery, and emotion to evoke mood. Throughout he will consider the practical aspects of working by the water - including the advantages of ‘travelling light’. Karl has exhibited widely and has been featured in magazines including Lee Filters Xposure, and On Landscape. Over the past few years, he has worked with many leading manufacturers, including Phase One, Manfrotto, and LEE filters. Karl is currently an ambassador for Induro Tripods UK and Sigma Imaging UK, and in 2017 he gave his first talk at The Photography Show, on the theme of coastal photography, on behalf of Induro Tripods UK. The main Moorsview Seminar takes place on Saturday, but speakers and supporters are also offering a range of optional Moorsview Extras over the weekend from Friday 8th to Sunday the 10th September. These include a range of practical workshops, photo walks and open gallery events - you can find details, along with booking information at www.trailblazeroutdoors.co.uk/pages/moorsview. A touring exhibition will also support Moorsview 2017 - opening first at the Joe Cornish Galleries in Northallerton on Saturday 12th August. The exhibition moves to The Pickering Gallery for the weekend of the Moorsview seminar, before opening at the Inspired by Gallery at the North York Moors National Park Visitor Centre, at Danby on 19th October. Tickets for Moorsview 2017 normally cost £80 - including a buffet lunch and refreshments throughout the day. 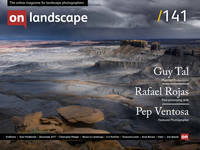 OnLandscape subscribers can take advantage of a £10 discount on the normal cost. Proceeds from Moorsview 2017 will be split equally between the Scarborough and Ryedale Mountain Rescue Team and local wildlife and conservation charities. The event is supported by a arrange of organisations including the North York Moors National Park and Welcome to Yorkshire. We are also grateful to Tim and Charlotte at On Landscape for their continuing technical and editorial help, and all of the speakers at the event - who have donated their time and expertise completely free of charge.